Spin Palace Casino :: Battlestar Galactica video slot - PLAY NOW! ISLE OF MAN, 5th December 2012 – Today, Microgaming, the world’s largest provider of online gaming software, launches its revolutionary Battlestar Galactica™ video slot. Based on the critically acclaimed science-fiction drama, the Battlestar Galactica (BSG) video slot has been developed by Microgaming through a licensing agreement with NBCUniversal Television Consumer Products. Battlestar Galactica is a gripping saga focusing on humanity’s last remnants and their struggle to find a new home whilst fleeing their deadly Cylon enemies. Celebrating its 35th Anniversary in 2013, Battlestar Galactica has become a globally recognised brand. In 2003, BSG captured the minds of a new generation of fans when Universal Cable Productions remade BSG into an action-packed, drama filled mini-series. The mini-series enjoyed strong international appeal with the series finale reaching over 14million viewers worldwide. 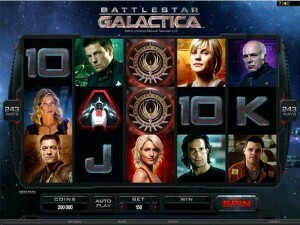 Microgaming’s Battlestar Galactica game captures all of the excitement of the television series that became a worldwide phenomenon. The BSG video slot immerses the player into a gripping audio-visual experience with a star studded cast of characters. Among the technological advances in its gameplay is an innovative Achievement Ranking System, which unlocks more video content for the player as they move through the game. In addition, the slot features different modes, including ‘Run’ and ‘Fight’ that a player can enter at any time. Battlestar Galactica™ :: You can try this NEW Slot game right now at the following casinos: Spin Palace Casino, Maple Casino, Casino Mate, Crazy Vegas Casino, Golden Riviera Casino, Roxy Palace Casino and Vegas Palms Casino.